We’re all still on a high from the Litfest. Apart from all the antics and stimulating talks, forums and panel discussions in the Grain Store and Big Shed, there was also a packed schedule at the Ballymaloe Cookery School with three and sometimes four events running simultaneously. This week I want to share some of my personal highlights. However, I had exactly had the same frustrations this year as before, having invited many more of my food heroes to Ballymaloe. I simply couldn’t get to many of the concurrent events but did get fantastic feedback. Allegra McEvedy has a cult following for her wholesome and gutsy food and her irreverent style further endears her to her fans. She gave a cookery demonstration of some of her best loved dishes. The response to her delicious food was overwhelmingly delightful. Arun Kapil told the fascinating story of Green Saffron and his book Fresh Spice in a packed Blue Dining room. A little while later multi award winning, Kevin Thornton spoke to a rapt audience about his travels in Ethiopia – the photographs in his book all styled and taken by Kevin himself showed another hugely creative side of this enormously talented chef. 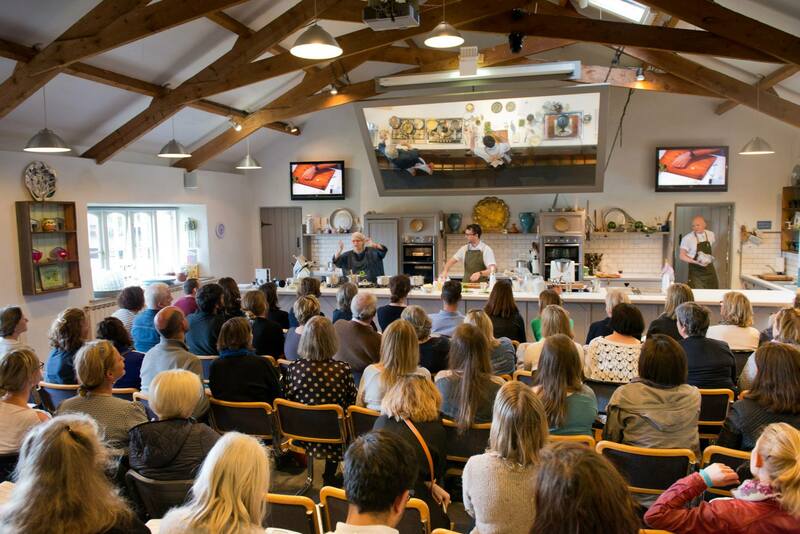 Still staying with our Irish stars, Hugo Arnold and Leylie Hayes of Avoca gave a riveting three hour cookery demonstration of some of the iconic dishes that has made Avoca such a huge success. Later Jack Monroe, who shot to fame a number of years ago when she started a blog ‘A Girl called Jack’ on feeding herself and her son on £10 sterling a week. This was an interactive cookery demonstration where people could bring a child along free of charge. Jack’s writing style is chatty and entertaining. Her food brilliantly creative and delicious, illustrates how well you can eat on a miniscule budget when one have the cooking skills to transform a few inexpensive ingredients into a yummy meal. Charlotte Pike, one of our past 12 Week Certificate students taught a Fermentation workshop and packed a ton of information into a short time. Her fourth book FERMENTED will be published by Kyle Books on August 27th 2015. Organic Chicken:- It becomes increasingly difficult to find an Irish organic chicken. We now bring our organic chicken from Wexford where Mary Regan and her family rear chickens and a few Aylesbury ducks on their 17 hectare organic farm near Enniscorthy. They have an on-farm abattoir so they can look after the birds from chicks to the table. The birds are ready for the table at around 12½ weeks as opposed to 28-32 days in intensive production systems. Needless to say the cost of caring and feeding the free range birds with non GM organic feed over that extended period is reflected in the price, but in organic chicken you are also paying for what’s not in it! Sarit Packer & Itamar Srulovich from Honey & Co in London cooked a lunch at Ballymaloe House during the Litfest. The flavours thrilled the guests and frustrated those who couldn’t get tickets. But the good news is Sarit and Itamar are returning to the Ballymaloe Cookery School on Saturday June 6th to give a one day course. Their restaurant Honey & Co is one of London’s most talked about, we love their fragrant Middle Eastern food packed with vibrant flavours. Mix all the dry ingredients together in a large bowl. Add the treacle and enough milk to make a moist dough, like stiff porridge. Place the bread dough in a greased 900g (2lb) baking tin, sprinkle with the 10g (1/2oz) of mixed seeds you kept back and bake in the preheated oven for 15 minutes or until bread has risen, then reduce temperature by 10 degrees and continue cooking for a further hour. The bread should be well browned and sounds hollow when turned out of the tin and tapped underneath. Leave on a wire rack to cool. This bread is delicious served with either sweet preserves or equally nice with good cheese, smoked fish or charcuterie. Best eaten on the day it is made but delicious toasted on day 2 or 3. Warm the cumin and coriander seeds on a dry pan for a few minutes until they release their natural fragrance. Grind them in a spice grinder or pestle and mortar. Place the beetroot, chick peas, onion, Tahini, garlic, oil, coriander and spices in a large bowl and mix well. Season the mixture generously with salt and freshly milled pepper. Add just enough gram flour to bring the mixture together to a consistency that will hold its shapes when rolled into little balls. To cook the falafel, either deep fry in a deep fat fryer or alternatively shallow fry in a little sunflower oil until lightly browned and then transfer to a moderate preheated oven for 10 minutes. Grate a whole cucumber, and place in a colander or sieve, sprinkle with a little sea salt and allow drain for around 20 minutes. Press the cucumber against the side of the sieve to extract as much excess moisture from it as you can. Then place in a large bowl mix with 125g (4 1/2oz) thick Greek style yoghurt, 1 clove of crushed garlic, some freshly chopped mint and a little freshly ground black pepper and salt to taste. This started out as a curious thought in the back of my head – I know garlic softens and sweetens the longer you cook it, so could I make garlic jam? I scribbled some notes based on what little I know about jam making, dug out an old onion marmalade recipe to use as a rough guide, and promptly forgot all about it. Wash and rinse your jars and lids, and pop them on a baking sheet in a low oven, around 120°C/250°F/1/2 Gas Mark will do. Bake them for 10 minutes to sterilise them, then turn the oven off – without opening it – until you need the jars. Peel and slice your garlic cloves and toss into a heavy-bottomed pan with the oil. Bring to a very low heat to soften for 10 minutes – don’t allow them to brown or burn. (if you find peeling the cloves hard work, chop the top and bottom off and drop them into a jug or bowl of boiling water. Allow to soak for half an hour – they should slip right out of their skins). Pour over the vinegar, wine and half the sugar, and bring to the boil. Toss in the thyme leaves and reduce the heat back down to a simmer. Simmer for a further 15 minutes to soften, then mash with a masher to break up into small pieces. Add the remaining sugar and stir well. Bring to the boil and boil vigorously for 5 minutes, stirring well to stop it sticking to the bottom. Add a splash more wine to loosen if necessary. Remove from the heat and drop a teaspoon of the jam mixture onto a saucer. If it starts to set around the edges, it’s good to go. Remove the jars from the oven – with a tea towel or cloth as they will be hot! Pour the jam carefully into the warm jars, and balance the lid on top to cool. Once cooled, label and seal the lids, and store in the fridge or in a cool, dry place away from direct sunlight. Here I have brought together two of my favourite cookies into a classic combination of peanut butter and jam. My small boy loves making the thumbprints in these and spooning in the jam, and it’s a happy rainy-day activity to do together – although having such tiny little thumbs, he does his with a teaspoon! Preheat the oven to 180°C/350°F/Gas Mark 4, and lightly grease a baking sheet in preparation. Cream the butter and sugar together in a mixing bowl with a wooden spoon until softened and well combined. Add the egg yolk and the peanut butter, and mix until the peanut butter is evenly distributed through the mixture. Spoon in the flour and stir to make a soft dough. With lightly floured hands, break off a walnut-sized piece of dough. Place on the prepared baking sheet and flatten slightly with a fork. Repeat with the rest of the dough. Using your thumb, or a teaspoon, make a deep well in the centre of each flattened ball of dough – the cookies will flatten and spread out slightly as they cook, so don’t be afraid to dig in! Melt the jam slightly in a microwave for 30 seconds on a low setting, then spoon a little into the centre of each cookie. Bake in the centre of the preheated oven for 10 to 12 minutes, or until golden. Try different flavour combinations, such as grated white chocolate in place of peanut butter and lemon curd instead of jam. Or try dark chocolate with blackberry jam for a dark, delicious “Black Forest gateau” version. God bless the peasant farmers that came up with this, a supper of pig and fat and salt and sticks that reeks of rustic. We had it in a little local restaurant up in the hills around Florence, not far from the quarry where Michelangelo cut his teeth, not to mention some rather fine marble. This dish isn’t the healthiest thing you’ll ever eat, but it may well be one of the yummiest. The authentic fat to use is a block of Lardo di Colonnata, a salted pork fat cured with rosemary, which if you ever come across it is a must buy situation. A kilo block of Lardo is one of the more treacherous illegal imports I’ve brought home, but it goes a long way and made me happy for a good couple of months. Probably the best substitute is a piece of fatty pancetta, heated in a frying pan so that the fat melts, topped up the amount needed with olive oil. Or even a block of lard, but I’d add a bit of extra virgin olive oilin there for flavour, as this dish is all about flavourful fat. And if you really don’t want to use animal fats you can use just olive oil, but I’d be inclined to say in that case this recipe is not for you. Rosemary from the garden is ideal as it has woodier stems – better for supporting the weight. Serves 4 and takes half an hour at the beginning, then an hours marinate then 20 to finish it off. Strip the leaves from the rosemary stems, just leaving a bushy tip on each one and finely chop the leaves. Cut the tenderloins into slices about 3cm (1 1/4 inch) thick (to make about 16 pieces) and marinate them in the extra virgin, half the garlic and half the chopped rosemary for about an hour or so. Once the meat has had as much marinating time as you can afford it, preheat the oven to 200ºC/400º/Gas Mark 6. Heat the pork fat in a small pan and gently fry the rest of the garlic and rosemary leaves with a good seasoning of salt (you won’t need any salt if you’ve managed to get hold of lardo). Season the tenderloin pieces with salt and pepper. Cut the ciabatta into chunks about the same size as the pieces of pork – you’ll need 20 pieces. Dip the pieces of bread into the melted fat, pressing each one down so that they really soak it up, and as you do this thread the bread and meat alternately onto the rosemary sticks: five bread pieces and four pork pieces per stick, each one starting and finishing with a piece of bread. Line them all up on a baking tray, spoon over any leftover fat and put into the oven for 12–15 minutes. Leave to rest for a couple of minutes, then carefully lift them onto a suitably gorgeous serving dish and pour over any juices that have come out of the meat. Serve with wedges of lemon and a plain tomato salad, as in no dressing or seasoning – there’s enough grease and salt going on already! Foraging beware you can get hooked, it is so fun that it quickly becomes addictive. Where others merely see a clump of weeds we visualise a yummy dinner. We’ve had several exciting foraging courses recently including one Slow Food foraging session. All were packed with people eager to learn what for many is an almost forgotten skill. It’s free and available in both urban and rural areas, in the woods, by the sea shore, in the fields, on stone walls, all year round. Unbelievable but true, just walk outside your door, open your eyes in a new way, what do you see? Any daisies, primroses, dandelions. They are all edible, pluck the little petals from the daisy and scatter them over a salad, that’s called ‘daisy confetti’, how cute is that. Dandelion leaves and flowers are both edible. The leaves are quite bitter but fantastically good for you. For many of us ‘Bitter’ is an acquired taste, we’ve become used to the easy sweetness of tame vegetables. I love it but if you’d rather a more delicate flavour, cover the dandelion plant with a bucket or lid to blanch the leaves to pale yellow just like the ones you’ll find in French bistro salads. The familiar yellow flowers make delicious dandelion fritters as do the leaves of comfrey. We crystallize many of the wild flowers including primroses and violets. Scurvy grass is available all year, so called because its high vitamin c content protected sailors from scurvy (cochlearia officinalois) You’ll find lots of uses for the fleshy leaves and slightly peppery taste. The pretty flowers can be also be scattered over salads. It grows along the seashore and in saline conditions. Wild Sorrel is also abundant at present, its tiny spear shaped leaves grow out of the grass in fields, ditches and along the cliffs. The leaves of Bucler leaf sorrel are also small and are shaped like an old bucler shield. Its tart zingy lemony flavour adds a clean fresh note to salads, sauces and soups. At the launch of the Kerrygold Ballymaloe Literary Festival of Food and Wine Katie Sanderson and Jasper O Connor at the Fumbally Câfé in Dublin paired sorrel with honey carrageen moss pudding, a totally delicious and inspired combination. These two young chefs are worth watching, if you haven’t already been to the Fumbally put in on your Dublin list. The Midleton Farmers Market will celebrate its 15th anniversary on Saturday May 30th. There are lots of exciting activities planned for the morning – local music, spot prizes, tastings, painting competition and lots more….9.30am-1pm. A copy of Best Salads Ever has just landed on my desk in time for summer. This paper back of sensational salads by Sonja Bock and Tina Scheftelowitz has just been translated from Danish – a bestselling title in Denmark where it sold 83,000 copies and growing….published by Grub Street. Sheridans Irish Food Festival is now in its 6th year and this Sunday 24th May is jam packed with local food stalls, workshops, tastings and demos. As well as the famous National Irish Brown Bread competition in the The Brown Bread Tent hosted by RTE’s Ella McSweeney. Check out the website www.sheridans.ie for the details. swollen and exuding jelly. You need as much of this as possible through the strainer and whisk it into the egg and milk mixture. Test for a set in a saucer as one would with gelatine. Whisk the egg white stiffly and fold or fluff it in gently; it will rise to make a fluffy top. Chill and allow to set for 3-4 hours or overnight. Meanwhile make the chocolate soil. In a saucepan on a medium to high heat place the sugar and water, give it a stir but try not get any water crystals on the side. The sugar will melt and start to boil and bubble. You want the mixture to reach to 135C. If you don’t have a thermometer the mixture will start to turn a golden brown. At this stage you want to work fast and pour the chocolate mix into the pot while whisking. It will dry out and turn to soil almost immediately. Magic. Cool on a nonstick baking tray. It keeps for ages. Next mix 3 parts sorrel juice with 1 part freshly squeezed Granny Smith apple juice or to taste. To serve pour a little sorrel and apple juice into a glass. Top with carrageen. Pop a little blob of softly whipped cream on top and sprinkle with chocolate soil. Serve. The bottles need to be strong and well sealed, otherwise the Elderflower champagne will pop its cork. Preheat the oven to 180°C/350°F/ gas mark 4. Grease the tin well with melted butter and dust with a little flour. Put the ground almonds, icing sugar, lemon zest and flour into a bowl and mix well. Make a well in the centre and add the egg yolks, the cooled melted butter and the lemon juice. Stir until the ingredients are thoroughly mixed. Spread the cake mixture evenly in the prepared tin, make a little hollow in the centre and tap on the worktop to release any large air bubbles. Bake in the oven for about 20 minutes. The cake should still be moist but cooked through. Allow to rest in the tin for 5–6 minutes before turning out onto a wire rack to cool. Sieve the icing sugar into a bowl, and mix to a thickish smooth icing with the lemon juice and zest. Spread it gently over the top and sides of the cake using a palette knife dipped in boiling water and dried. Decorate with the crystallised primroses and little diamonds of angelica. 1.Use fairly strong textured leaves, the smaller the flowers the more attractive they are when crystallized eg. primroses, violets. 2.The castor sugar must be absolutely dry, one could dry it in a low oven for about 2 hour approx. 3.Break up the egg white slightly with a fork. Using a child’s paint brush it very carefully over each petal and into every cervice. Pour the castor sugar over the flower with a teaspoon, arrange the flower carefully on bakewell paper so that it has a good shape. Allow to dry overnight in a warm dry place, e.g. close to an Aga or over a radiator. If properly crystallized these flowers will last for months, even years, provided they are kept dry. We store them in a pottery jar or a tin box. 4.When you are crystallizing flowers remember to do lots of leaves also so one can make attractive arrangements – e.g. mint,lemon balm, wild strawberry, salad burnet or marguerite daisy leaves etc. A bowl of mashed potatoes flecked with wild garlic and a blob of butter melting in the centre is ‘comfort’ food at its best. Put the roughly chopped wild garlic leaves into a saucepan. Cover with cold milk and bring slowly to the boil. Simmer for about 3-4 minutes, turn off the heat and leave to infuse. Peel and mash the freshly boiled potatoes and while hot, mix with the boiling milk and wild garlic, beat in the butter. Season to taste with salt and freshly ground pepper. Serve in 1 large or 6 individual bowls with a knob of butter melting in the centre. Wild garlic mash may be put aside and reheated later in a moderate oven, 180°C/350°F/Gas Mark 4. Cover with tin foil while it reheats so that it doesn’t get a skin. Just before serving put a blob of butter into the centre and sprinkle with wild garlic flowers if available. 8 handfuls of salad leaves, cut or torn into generous bite sized bits. Choose a bowl, large enough to hold the salad comfortably, sprinkle with enough dressing to coat the leaves lightly. Add a fistful of finely grated Parmesan. Toss gently and add the warm croutons (if using.) Toss again. Divide between eight cold plates. Top each salad with a couple of anchovies and serve. Just a week to go to the Kerrygold Ballymaloe Literary Festival of Food and Wine 15th-17th May, there’s a mouthful! Could just be the longest title of a food festival anywhere in Ireland. Things are really hotting up here at Litfest HQ. The action takes place at Ballymaloe House, the Grain Store, The Big Shed and at the Ballymaloe Cookery School in Shanagarry. Again this year, we’ve got an amazing line up of speakers, workshops and events. The Food and Drinks Theatre has expanded and the Fringe Festival in the Big Shed at Ballymaloe is exploding! I can scarcely keep up with all the exciting developments. Just keep checking out www.litfest.ie. So here’s a taste of what’s to come. Alice Waters is coming at last. She had planned to be with us for the inaugural Litfest in 2013 but had to cancel just days before because of a fire at Chez Panisse, her legendery restaurant in Berkeley in California. She’s really excited to be coming to Ballymaloe once again and texted the other day to say she’s counting the days – how sweet is that. We’ve also managed to entice Christian Puglisi from Relae and Manfreds og Vin in Copenhagen. He’ll share his intriguing story and talk about his new award winning book Relae. April Bloomfield described as the ‘best woman chef in America’, burst onto the New York food scene with her cooking at The Spotted Pig gastro pub plus John Dory, the Breslin…she’ll be doing a cookery demonstration on Saturday May 16th at 9.30am. Sarit Packer and Itmar Srulovich of Honey & Co in London are sweethearts, they too are coming over. Their dinner is sold out but they’ll be with us all weekend so you can get your Honey & Co book signed. Sam and Samantha Clark of Moro and Morita’s dem is also sold out but they are in conversation with Rory O’ Connell in The Grain Store on Sunday May 17th at 2.30pm. Don’t miss my friend, David Tanis, New York Times food correspondent and chef at Chez Panisse for 25 years. He will read from his book award winning, One Good Dish. Multi award winning Parisian, author and blogger David Lebovitz who also came to the New York launch is participating in several sessions. Lovers of Chinese food won’t want to miss Fushia Dunlop, described as the best writer in the West on Chinese food, she’ll do a cookery demonstration at the Cookery School on Sunday. And there’s Allegra McEvedy, Rachel Allen will host her cookery dem at the Ballymaloe Cookery School on Saturday May 16th at 10am. Jack Monroe is a fresh new voice in food you can also bring your child, FREE to Jack Monroe’s Parents and Children’s interactive cookery dem at 2pm on Saturday. We’ve also got an amazing line up of Irish chefs. Kevin Thornton, from Thornton’s restaurant in Dublin, JP McMahon from Cava and Anair in Galway and Leylie Hayes and Hugo Arnold…. Several past Ballymaloe Cookery School students as well as Leylie Hayes will strut their stuff, food historian Dorothy Cashman, Green Saffron, Spice King Arun Kapil and Charlotte Pike who will do a Fermentation workshop to coincide with publication of her new book Fermented Food and Drink. Check out cookbook chronicles with Caroline Hennessy. For budding food writers Regina Sexton will host a UCC Food Writing workshop. ………This year for the first time, Cully and Sully have teamed up with Michael Kelly to create Veg About beside the Big Shed. It’s all about sowing, growing, eating and composting – a celebration of the great food cycle from plot to plate. There will be a Garden Tent where there is Rants, Raves and Ruaille Buaille, Banter with Jim Carroll. Don’t’ miss foraging with legendary Roger Phillips, Alys Fowler….. The Litfest fringe in the Big Shed continues to gather momentum. Can you imagine it could be even more happening than last year? A wide range of local and national artisan food producers, art installations, upcycled furniture by Elemental Design and wonderful artists like Aoife Banville, Yvonne Woods and Sharon Greene. Camilla Houston will be in the Family Corner, she has organised fantastic interactive, educational and fun activities for children to get involved in. Sommelier, Colm McCan is the Wine and Drinks Events Manager of the Food and Drink Theatre. Wait, till you see what he has in store natural wines, artisan beer and ciders, spirits and cocktails, you’ll get to see cocktail guru Dave Broom and Nick Strangways, master gin distiller Desmond Payne. One of the top brewmasters Garrett Oliver from America will be here and coffee guru Tim Wendelboe comes all the way from Norway. He’ll tell you the story of Bean to Cup. Aah, I’m running out of space and there’s SO much more check out the website for events though most events are indoors storm the heavens for good weather. Kirsti O’ Kelly of Silver Darlings, based in Co. Limerick. Kirsti pickles herrings using traditional recipes handed down from her mother and grandmother in her native Finland. Kirsti has won several awards for her beetroot and horseradish and Star of the Sea herring. Catch her every Saturday at the Limerick Milk Market. Don’t miss Jack Monroe’s Parent and Children Interactive Cookery Demonstration at the Ballymaloe Cookery School on Sunday May 17th. Parents are invited to bring along one of the younger members of the household (8-12 years) to attend the demonstration for free and Jack will call on some of the juniors to join her at the demonstration counter for practical cooking fun. See the litfest website (www.litfest.ie) for the details. First make the crisp bread. Preheat the oven to 180°C/350°C/gas 4. Melt the butter, and as it is melting, carefully split the pitta in half lengthways and brush the bread on both sides. Place the pitta halves on a rack in the middle of the oven. Bake for about 10-15 minutes or until golden brown. Remove and cool. Heat the chicken stock in a large saucepan and check for seasoning. Bring to a gentle simmer and add the broad beans, peas, asparagus and artichokes. Cook for 1-2 minutes until the vegetables are tender. Remove from the heat and add the herbs, spring onion, lemon juice and crisp bread broken into small pieces. Season again and serve hot. Heat the oil in a frying pan over a high heat until it just starts to smoke. Carefully place the orange slices in the oil and cook for 30 seconds, then turn them over with a fork. Add the tomato, garlic, thyme, chilli and cardamom and cook on a high heat until the tomato slices start to break down a little (about 2 minutes). Add the prawns to the pan and season with sea salt and pepper. Cook them for a minute on each side. Add 3 tablespoons of water and cook for a further 2 minutes or until the prawns have turned pink. If the pan is looking dry, add the remaining 2 tablespoons of water, so that you have enough liquid to form a sauce. Serve immediately with bread to mop up the juices. Mix the onion, garlic, spices, lemon juice and oil in a bowl, add the chicken, coat well and refrigerate for 30 minutes or overnight. The chicken is best charcoal-grilled on a hot barbecue or seared on a griddle pan over a high heat, or under a grill, turning once until just cooked. To make the tahini yoghurt: put the tahini, yoghurt, lemon juice and olive oil in a bowl, season with salt and pepper and mix well. If the mixture seems too thick, loosen with a splash of water. Place the chicken on a plate and spoon the tahini yoghurt over the top. Sprinkle with the black onion seeds, chilli and fresh coriander. Serve with the lemon on the side. Crème brûlée the original ultimate custard. Here we flavour it with peach leaves, the latter almond flavour is strangely addictive. Many leaves impart delicious flavours to syrup, sorbets, ice creams and custard. We use the young leaves from the white peach tree on the front wall of the school dining room for this. Make at least 12 hours in advance. Heat the cream to shivery stage, turn off the heat and add the peach leaves and allow to infuse for 30 minutes. Mix egg yolks with ½ tablespoon of sugar. Pour it slowly onto the yolks, whisking all the time. Return to the saucepan and cook on a medium heat, stirring until it is thick enough to coat the back of a spoon. It must not boil. Remove the vanilla pod, pour into a serving dish and chill overnight. Be careful not to break the skin or the caramel may sink later. Next day make the caramel. Dissolve the remaining sugar in 75ml (3fl oz) water. Bring to the boil and cook until it caramelises to a chestnut brown colour. Remove from the heat and immediately spoon a thin layer of caramel over the top of the custard. Alternatively sprinkle the top with a layer of white castor sugar or pale demerara sugar, spray with a film of cold water, then caramelise with a blow torch. Allow to get cold and pipe a line of whipped cream around the edge to seal the joint where the caramel meets the side of the dish. Serve within 12 hours, or the caramel will melt. Crack the top by knocking sharply with the back of the serving spoon. Alternatively sprinkle the top with a thin layer of castor sugar and caramelise with a blow torch. 2 yolks only just set the cream. Be sure to use big eggs and measure your cream slightly short of the 300ml (½ pint). The cream takes some time to thicken and usually does so just under boiling point. It the custard is not properly set, or if the skin which forms on top while cooking is broken, the caramel will sink to the bottom of the dish. If this problem arises, freeze the pudding for 1-2 hours before spooning on the hot caramel. The most anticipated baking book of 2015 has just been published, it’s called The Violet Bakery Cookbook by Claire Ptak, whom Jamie Oliver described as “my favourite cake maker in the world”. This book is really significant for a variety of reasons, it’s written by someone who never set out to be a baker, Claire who is Californian went to university to study film making but she was forever darting in and out of the kitchen between classes and films to bake cakes. She even borrowed an oven on an island in Lake Atitlán in Guatemala to make a pie. A year working as an assistant to a Hollywood director still didn’t satisfy nor did a stint in a fancy San Francisco fashion boutique. Eventually in 2001 she landed a one day internship at Chez Panisse in California which led to her dream job. Under the direction of pastry chef Alan Tangren, Claire learned how to taste and tweak. Once again life intervened, Claire’s English boyfriend, (now husband) Damien, moved back to London – after three years they could no longer bear to be apart – Alice Waters who once told me that Claire was one of the most talented pastry chefs she ever had, tried hard to dissuade Claire from leaving but then wished her well on her new adventure and reminded her – “you can always come back to Chez Panisse” – they have remained firm friends and Alice wrote the forward to The Violet Bakery Cookbook. In London, Claire “did stages” in many of my favourite restaurants, St John, Moro, River Café, Anchor and Hope…..
Jamie Oliver, whom she’d met through friends in California was also supportive and she did food styling for him and many others including Yotam Ottolenghi for his weekly column in the Guardian. By now Claire was longing to open a bakery. Her first foray into business was selling her favourite cakes and cupcakes at the newly resurrected Broadway Market in Hackney – she used beautiful ingredients. The word spread like wildfire and she couldn’t keep up with the demand, so she and Damien found tiny premises in an unassuming residential street on Wilton Way near London Fields Park in Hackney in East London, they gave it a lick of paint and just planned to use the place as a commercial kitchen but locals kept knocking on the door and asking whether they were planning to open a Violet Bakery, now 5 years later the tiny space is a bustling bakery and super chic café with a cult following. Damien makes the playlists which the customers love almost as much as the cakes. The other reason why this book is interesting is that Claire’s baking does not necessarily look picture perfect but always tastes sublime. Interestingly this coincides with a general loss of faith among the general public in confectionary that looks super-professional but inadvertently ranges from disappointing to dire. Something that has a homemade quality tends to inspire more confidence, funny how things come full circle in the end. Claire has also become increasingly interested in alternatives to processed wheat and sugar and dairy free. She’s experimented a lot with wholegrains, unrefined sugar and fruit based alternatives. The results are wholesome and indulgent. Eating cake involves a certain degree of guilt so it’s really important to Claire that a cake “be worth it” so taste is paramount. The Violet Bakery Cookbook was published by Square Peg – here’s a taste to whet your appetite. This savoury bread pudding was inspired by one of my favourite pasta sauces. Butter a 20cm x 30cm baking tin. First, prepare the leeks. Trim the roots and the tough green stalks and outer layer from the leeks and discard. Cut the leeks in half lengthways and run under cool water to rinse, peeling back the layers to get inside where the grit is lodged. Slice the leeks crossways into 4mm slices and drop into a bowl of cold water for about 10 minutes. All the dirt will fall to the bottom. Scoop the leeks out (rather than pouring them out with the water) and place in a colander to drain. Pat dry. In a heavy-bottomed frying pan over a medium-low heat, heat the oil. Add the leeks, savory or rosemary and salt and pepper to taste, and sauté for about 10-15 minutes until soft but without colour. Bring a large pan of water to the boil and add enough salt to make it taste of the sea. Usually I add about 2-3 teaspoonful’s to a large pan of water. Strip the leaves of the kale away from the tough inner core and discard the core. Roughly chop the leaves into 2cm strips and drop into the boiling water for about 3-5 minutes, or until tender. Do this in batches if your pan is not large enough, then remove from the pan with a slotted spoon and place in a large bowl. Season with salt and pepper and toss with the tablespoon of olive oil, the chilli flakes and sautéed leeks. Set aside. Grate the Gruyere and weigh out the ricotta, then set these aside as well. In a bowl, whisk together the custard ingredients and then strain through a fine sieve into a jug. In your prepared baking tin, layer the bread, kale mixture and half the Gruyère, then dot with the ricotta. Pout two-thirds of the custard over the cheese, then sprinkle with salt, pepper and nutmeg. Let the pudding rest for at least 30 minutes to absorb the custard. Meanwhile, preheat the oven to 180°C/160°C (fan)/ gas 4. Cover the pudding with the remaining Gruyère and pour the remaining custard over the top. Bake for 1 hour until golden. Cut into portions and serve warm or at room temperature. 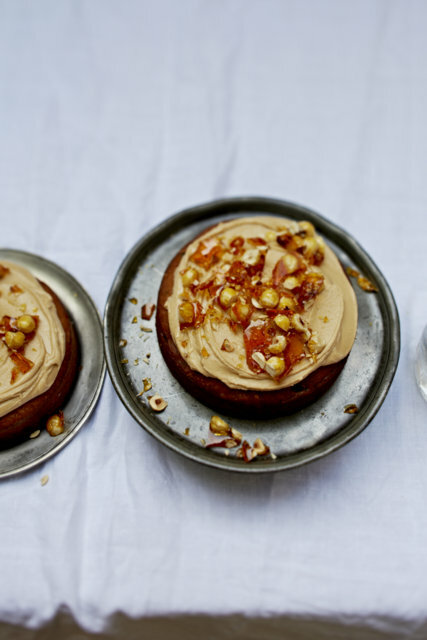 Hazelnuts and toffee are good companions and the dates bring the whole thing together. The golden hue of this fruit cake reminds me of the falling leaves of Autumn and it’s ideal for serving at Christmas. I’ve made the recipe for two small cakes partly because it is rich and also the second makes a lovely gift, wrapped in baking paper sealed with a snazzy sticker or patterned tape. It’s fun to make personalised potato prints to decorate the paper before wrapping it. Preheat the oven to 170°C/150°C(fan)/gas3. Butter two 18cm cake tins and line with parchment paper. First, prepare the sponge. Combine the dates and the toasted nuts in a bowl and set aside. Using an electric mixture, whisk together the eggs, vanilla and sugars until light and fluffy. Continue to whisk as you slowly drizzle in the oil. In another bowl whisk together the flour, baking powder and salt. Add this to the egg mixture and whisk for a few seconds to combine. Add the yoghurt and whisk to combine then fold in the dates and hazelnuts. Divide the mixture between your prepared tins and bake for about 35-45 minutes, until the cakes are baked through and set, but not dry. The tops of the cakes will not spring back as much as other cakes do because the dates make the mixture moist and dense in the best possible way. Leave the cakes to cool in their tins while you make the topping. Line a baking try with parchment paper and spread your toasted hazelnuts on the tray. Place the tray on your worktop, near the hob. Have your icing ingredients nearby, as they will be needed as soon as the caramel is ready. Put the 50g water in a small, heavy-bottomed pan and sprinkle in the caster sugar. Bring to the boil and just as the sugar starts to caramelise watch it very closely, then as soon as it starts to burn, pour half of the hot caramel over the hazelnuts. Leave to cool and harden and then break into shards. To make the icing, add the 4 tablespoons of water to the remaining caramel in the pan. Pour the runny caramel from the pan into the icing sugar and whisk to a smooth paste. Add more water or icing sugar until it has the consistency of soft buttercream. TASTE. Does the icing taste too sweet? It might need a splash of brandy or cognac to mellow it out. The cake itself is not too sweet so it can handle a fairly sweet icing, but cutting it with a little booze can work well here. To finish, spread the icing on the cooled cakes and top with the shards of praline. Angelica is a great pairing with tart rhubarb. It can downplay the tartness of the rhubarb without you having to add too much sugar. Slice the rhubarb into small pieces. Put them in a heavy bottomed saucepan with half the sugar and leave to macerate for 1 hour. Add the remaining ingredients to the saucepan except the Chartreuse (don’t forget the remaining sugar). Place over a medium heat and bring to the boil slowly, stirring with a wooden spoon until the sugar has dissolved. Once it has dissolved, stop stirring and boil rapidly for 15 minutes. Add the Chartreuse and boil for a further 5 minutes. The jam is ready when most of the rhubarb is nearly translucent and the consistency has thickened. At this point you spoon the jam, including the angelica stalks, into warm sterilised jars and seal, or simply put the jam into a suitable container (with a tight-fitting lid) and keep in the fridge for daily use for up to a month. 7th May 2015 : Bellingham Blue in Castlebellingham Co. Louth. 16th May 2015: Killeen Cheese near Portumna in Co. Louth. 26th May 2015, 29th June: St. Tola Organic Goat Cheese, near Ennistymon, Co. Clare. 13th May 2015: Cooleeney Farmhouse Cheese, near Moyne, Co. Tipperary. 15th May 2015: Cashel Blue near Fethard, Co. Tipperary. 15th May 2015: Coolea Cheese, Coolea Co. Cork. Bring your kids along too, to reconnect them with how beautiful food is produced. Smoked Butter: have you discovered Mr Hederman’s smoked butter yet? It’s not widely available but you’ll find it at his stall at the Midleton Farmer’s Market alongside his warm and cold smoked fish, fishcakes and addictive smoked mussels. www.frankhederman.com. Midleton Farmer’s Market will soon be celebrating 15 years, watch this space for events, www.midletonfarmersmarket.com. They’ve always wowed their clientele on great vegetarian food and now they’ve shared their secrets in “The Happy Pear” Cookbook published by Penguin. Fresh and gorgeous tasting food, bursting with goodness, www.thehappypear.ie.